Who’s ready for the healthiest, coziest and easiest Sunday night dinner? crockpot thai broccoli rabe chicken curry from Half Baked Harvest on Vimeo. This Crockpot Thai Broccoli Rabe Chicken Curry gives off a super cozy feel, and is the perfect, quick, easy, and healthy meal. For me, Sunday dinners should be filling, comforting and cozy…especially during these bitter cold January days. As I mentioned earlier this week, I’m really trying to have a much healthier work to life balance. Not going to lie, it’s a tricky thing to do, but these crockpot recipes are perfect because you can simply add everything into your crockpot in the morning, and come home at night to a house that smells incredible…and more importantly, a delicious meal just waiting to be shared! Equally great on both busy working weekdays or jam-packed weekends. I love making this dish after a day of fun winter activities like snowboarding, snowmobiling or simply just playing all day in the snow. When I come home exhausted and starving, it’s always nice to know I already have dinner taken care of. Thai Broccoli Rabe Chicken Curry is quickly becoming one of my favorite crockpot recipes. I have made it at least three times in the last month alone. Granted, I’ve had a ton of people to feed, but it’s been a true life saver recipe. Everyone seems to really enjoy it and it’s beyond easy. Dishes with curry are one of my favorite foods to make because you can really adapt them to the season. 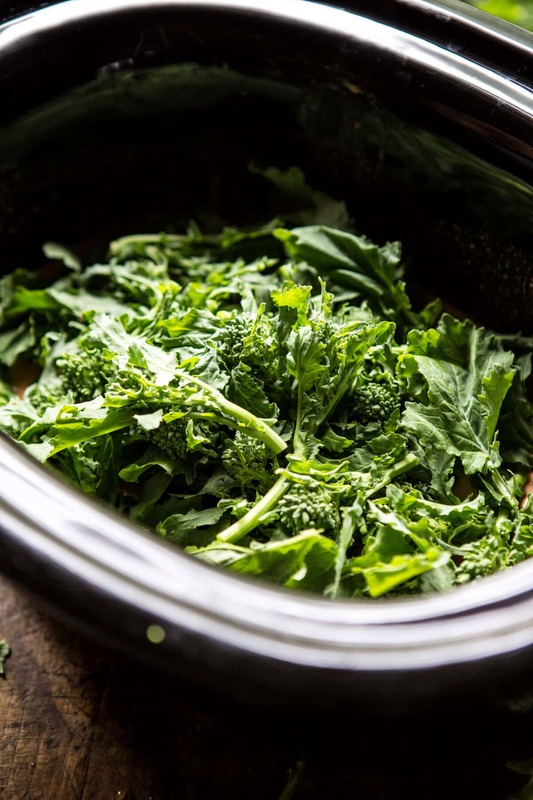 For this crockpot dish I used my favorite hearty winter vegetable, broccoli rabe, it’s perfect for these colder weather days. If you guys are new to broccoli rabe, I really want to encourage you to try it. It’s awesome in soups and stews because it holds up really well to longer cooking times. It’s also delicious when simply roasted in the oven with a little olive oil, salt and pepper. The leaves become crunchy, almost potato chip like…yum, YUM. Also included in this yummy curry is a healthy amount of garlic, lemongrass and my favorite Thai red curry paste. Not only do these ingredients add flavor, but they are nutrition powerhouses that help fight off sickness (which I think we can all use at some point during the winter months!). I used chicken as my protein source, but if you are a vegetarian, I think using chickpeas or lentils would be equally delicious. My favorite way to serve this curry is with a side of rice, plus fresh naan for soaking up that awesome curry sauce! I mean, obviously. If you’re looking for a more fiber packed side, try using quinoa or brown rice, I think both would be awesome! Also, can we talk about how pretty this bowl is? As you can tell from the first week of Healthy January, I am all about bringing in the colors of winter. Bright citrus, hardy winter greens, rainbow-colored root veggies…these are totally where it’s at! In the bowl of your crockpot, combine the onion, garlic, ginger, lemongrass, curry paste, fish sauce, coconut milk, and honey. Add the chicken and broccoli rabe, toss to combine. Cover and cook on LOW for 5-6 hours or on HIGH for 4-5 hours. Just before serving, stir in the basil and or cilantro. Serve the curry over a bowl of steamed rice. 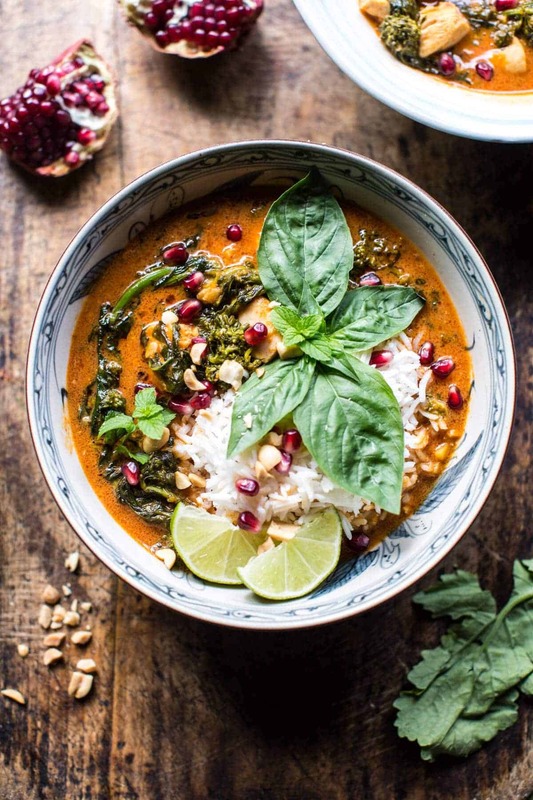 Top with pomegranate arils, peanuts and fresh basil or cilantro. Eat! Happy Sunday guys! Here’s to fun activities and warm curry for dinner! <–DO IT. 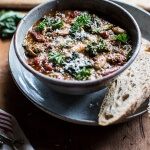 Crockpot Italian Chicken and Broccoli Rabe Chili. Need a warm bowl of deliciousness when it’s this cold. Perfect for the cold! Hope you get to make it Nancy, thank you! Tieghan, enough with the pomegranates. The colors are pretty, but every picture you have is dripping with pomegranates. Hey Dianne, it’s winter and pomegranates are in season, so I like to use whenever I possibly can. It was not planned to have three recipes with pomegranates go up back to back, but sometimes things like this happen by mistake. That said, pomegranates are one of my favorite fruits. If you prefer not to use them, simply leave them out of the recipe. No big deal at all. Hope you are having a great New Year. Perfect for the cold weather we’re having Tieghan! This dish looks like it’s packed with flavor and nice and spicy! Yes so perfect for cold weather! Hope you love it Mary Ann! Thanks so much Rachel, hope you love it! This looks DELICIOUS and absolutely lovely ???!!! if I were to add lentils how would I go about doing so? Do I need to put them in the crock pot cooked or dry? Thanks! Hey Steph! I would add dry lentils in the beginning with the other ingredients. I think that will be great! Hope you love this! I agree with the comment above, enough with the sliced avocado and pomegranates with every recipe. And what about other vegetables that I’ve NEVER seen on this blog-o-sphere; swiss chard, fennel, cauliflower, green beans, eggplant, etc. 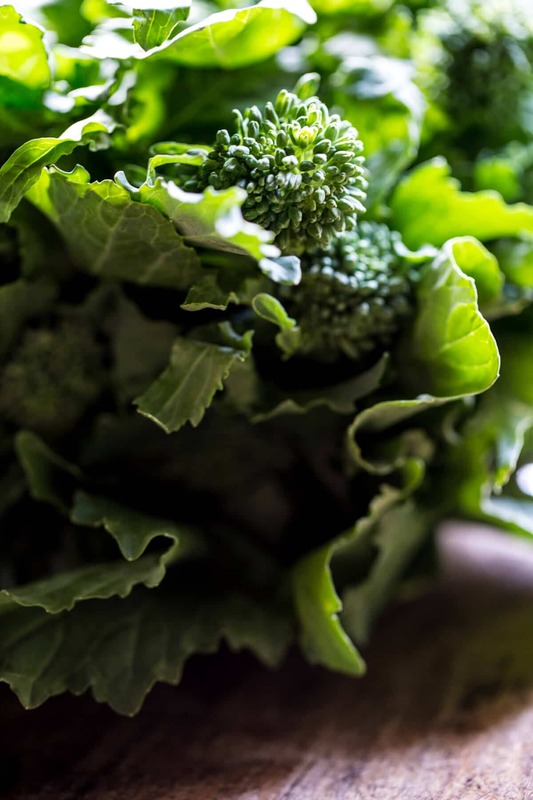 Your basic vegetable profile is sweet potato, sweet winter squash, zucchini, bell peppers, now broccoli rabe. . . which I love, but what about other veggies (like celery – yes, celery). Search cauliflower recipes in the search bar and you will find plenty. 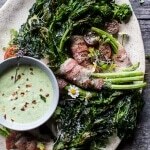 I have made a number of soups with chard as well as chard wraps, so search that too. I am personally not a huge fan of celery, fennel or eggplant, although I have a few eggplant and celery recipes too, so search that up. I use what I love to to cook with. If you don’t like my way of cooking, you do not need to follow along. I live by the rule that my mom always taught me, if you don’t have anything nice to say, don’t say it at all. Hope you are having a great New Year. Don’t listen to the naysayers, Tieghan. You keep doing what you are doing. I made this recipe tonight and it is delicious. WITH pomegranate arils. I support you. ?? Awh, thanks so much Kristi! I don’t have a crackpot, any idea how long this would take on the stove top? Looks so delicious! Hi! Just cook this on the stover for 1 to 2 hours or until ready to heat. Just be sure the chicken is cooked through before serving. Let me know if you have questions. Hope you love this! I don’t know what is going on with all this negativity, but I love your recipes, your writing, and logging on to your blog every morning! Keep up the great work. It’s awesome to see someone doing what they love. Maybe a dumb question- but is the chicken raw when added?? What brand of curry paste do you use? I usually buy mae ploy brandbut it’s pretty spicy so I’m a little concerned about the heat level if I use 1/4 C. This looks delicious. I like to use Thai Kitchen’s. It’s my favorite! Let me know if you have questions. 🙂 Also, you can use 2-3 tablespoons of curry paste for less heat. Tieghan, I LOVE broccoli rabe and this chicken curry recipe!!!! and I personally love all the pomegranate arils and photos and everything in this post. I’m with your mom, and love what you said above. Hey you’re awesome, all your recipes are AMAZING and I’m obsessed with avocado and pomegranate and everything else you use!!! All your avocado is honestly one of my favorite things about your blog! <3 thank you for all the great recipes! Thank you so much Juju! Means so much! I made this last night for my family exactly as written. It was delicious, I used both pomegranate AND avocado, my family loved it. Thanks for your great blog! So happy you guys liked it Debbie, thank you! Can’t wait to bust out the crockpot for this, it looks amazing! Let me know what you think Matt! Thanks! Alex and I are so into curry soups right now. Totally going to make this one! I hope you guys love it, thanks! This recipe looks amazing. The struggle for me with crockpot curries is that they start to lose their amazing flavor if cooked much beyond six hours, which takes them out of the weekday meal rotation. Fortunately, I have your crockpot french onion soup recipe cooking up for this evening’s dinner. It smells amazing and I can’t wait. Anyway, thanks for all the great recipes. Would always love to see the recipes where more time in the crockpot = better so I can make them on long work days. They can be tricky if you leave them in too long. Hope you loved the soup! Hello from France! I don’t remember how I discovered your blog, but congratulations! You seem young and passionate and, boy, I wished you were my daughter! I have been sharing your receipes with my friends and family (at least those who can understand English), and they all love them. 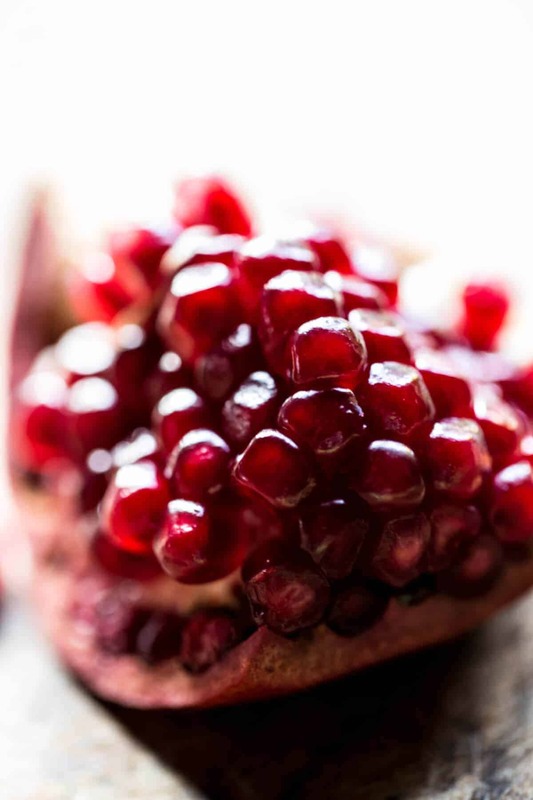 Pomegranate is an absolute marvel for your health, so everyone should enjoy them as much as possible when in season. I even planted one in my yard. Again, thank you and please keep posting those great receipts! Hi!! First of all thank you so much, these are such nice words! I couldn’t be happier you like the blog! Hope to hear from you more! Yes, kale or broccoli would both be great! Yum! Loving that bright curry color! Yes! So fun to shoot photos of, thanks girl! Glad you’re loving it, Laura! Thank you! Perhaps you should stop taking photos of vegetables altogether? Perhaps that would satisfy all the naysayers out there. ? 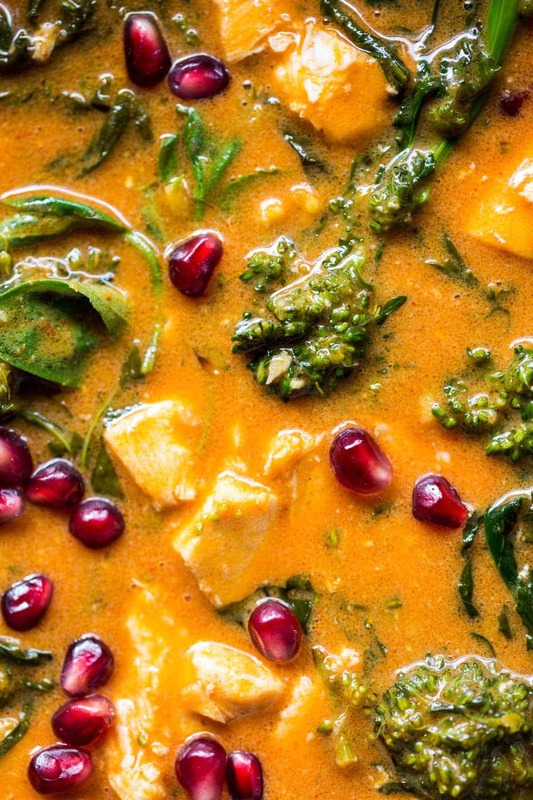 I don’t understand the negativity above, nor the dislike of pomegranates, because Thai curry + Pomegranate = Genius! Definitely going to try that combo! All your photos are amazing! Happy New Year! Thank you, James! 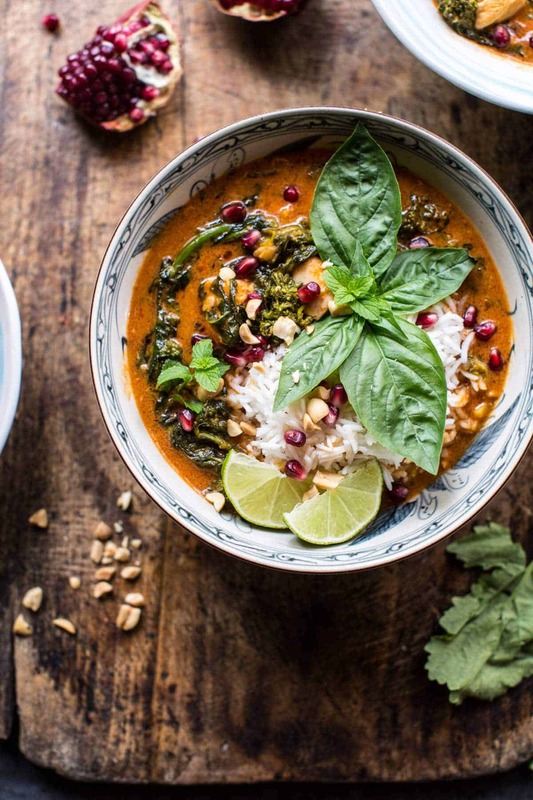 I am glad you are still loving the pomegranates and I hope you enjoy this curry! Have a great New Year! 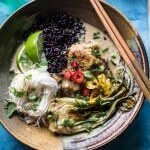 What happens if I use lite coconut milk in this recipe? I used one can full fat, one can light. turned out totally delicious… next time, I’ll use two cans light to cut down a bit more. Hi, I am sure that will be fine, but I have never used lite. It might be a little less creamy. hope you love this! 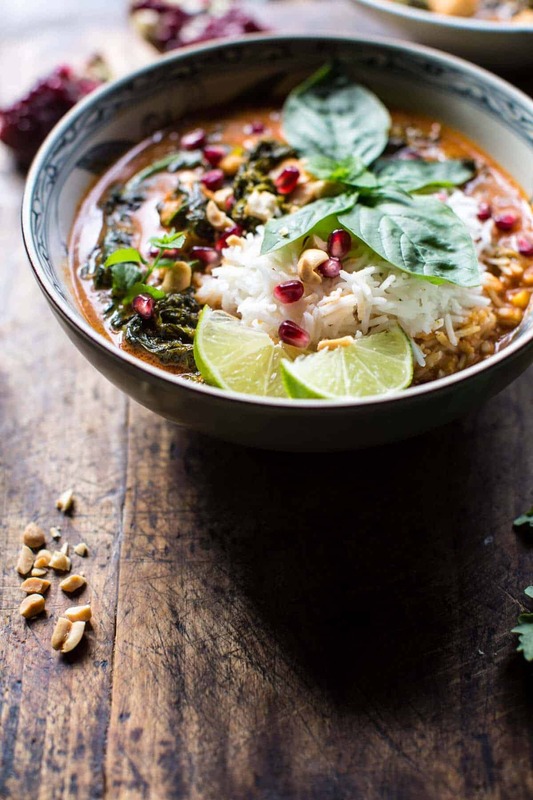 You just combined one of my favorite vegetables, the slow cooker AND Thai flavors, I’m SO into this dinner! Woo!! SO glad these have your favorite things, Gina! I hope you love it! Thank you! I live overseas, and it’s hit or miss on veg sometimes. No rabe today at the market, so I substituted kale and threw in some raw broccoli for extra veg. Upped the paste a bit cause we like heat, and OF COURSE, topped with peanuts, cilantro, basil, the pom seeds, and a squeeze of lime. Let it simmer on low low heat for 2 hours on the stove. TOTALLY. PERFECT. Can’t wait to make it again! Thank you! I am so happy this curry went perfect for you, Angela! Thank you so much! This was so yummy! Will definitely make again…thank you!! This recipe really caught my eye and I love just putting it all in and waking away! Great stuff! Happy New Year! I am so glad you are loving this, thank you Maura! I just made this last night and the taste is really good! Oddly, though, even though I used the right amount of red curry paste, it looks more like a green curry. I cooked it in the slow-cooker overnight on low for 6 hours and, because of that, it automatically set to warm for about 4 hours. Do you think the broccoli rabe turned it green from sitting too long? Wondering how you got yours such a nice red! Hi! I was wondering what your opinion is on subbing out the chicken with alternate options for a vegetarian spin. I was thinking adding potatoes+cauliflower and maybe eggplant instead of the chicken – since you’ve already made and tasted this I’m interested to see which you think is best! Hi! I think potatoes + cauliflower would be so mazing, great idea! I am not a huge fan of eggplant, but if you enjoy it, I would say go for it. Let me know if you have other questions. Thank you! This was so good. My store rarely carries broccoli rabe, so I used lacinato kale and broccoli. I actually received the comment that it was one of the best things I’ve made. Had to agree, it’s a great recipe, thanks. Wow that is so awesome! Thank you Jeff! 1. Do you really omit salt in this recipe, or is that an error? I added salt because.. I’ve never made a dish without salt and can’t physically bring myself to do it, haha. 2. 1/4 cup of curry paste seems like a lot – I want the flavor and the spice, but this is kind of an expensive ingredient for me to use so much of it on one meal. Anything else I could add that might be cheaper, to mimic the flavor? Thanks! Love the blog so far, ignore the naysayers and put those flippin’ pomegranates on whatever your heart desires! Hi! So, yes, I do omit the salt becasue the ingredients use contain salt, but please feel free to use salt to your taste! I get it, salt is the best! I think using 2 tablespoons curry past should be just fine. Add more spice with cayenne pepper. Let me know if you have other questions. Hope you LOVE this! I made this tonight. Really easy and delicious! 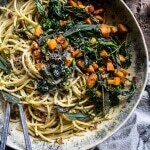 It would also be really good with winter squash! In my opinion , you can never have enough pomegranate. I love to take advantage of them while available! I completely agree! Thank you Tracy! Hello! I made this recipe but did not use the full fat coconut milk as you wrote in the recipe. While the dish was really full of flavor, the sauce was thin and somewhat separated. Can I assume it’s because I used light coconut milk? Or is it something else I might have done? Hi! Yes, I would think it is because of using light coconut milk. The full fat really helps to keep it creamy and thick. Glad you enjoyed the flavor, but sorry for the trouble! Let me know if you have questions. Thanks! I used full fat coconut milk and my sauce did the same thing. It was runny and separated. I wondered if I didn’t dry off the brocolli rabe enough? Hey Heidi! I am not sure why your milk separated. I have never had that happen. Was there a lot of water on the broccoli? Sorry for the trouble. No worries! After the first day, the sauce seemed to thicken up, and the flavour was amazing! However, it was SO spicy ;). I think I’ll use less than 1/4 cup next time! I’m used to spicy food, but I’m guessing the heat of different curry pastes probably varies widely! I love this recipe so much. Made a giant batch that fed hubby and I for three days. I used broccolette because they had a bunch of it at Costco and it cooked beautifully – not too mushy. I found that the trick was to ‘rest’ it on top of the other ingredients and let it steam. For anyone out there doing Whole30, this recipe is very easy to adapt. Sounds so awesome, I am glad it turned out great for you!! Thanks Andrea! Hi! What size of crockpot do you use in your recipes? Mine is 7 quarts. Hope you love this! WHat size has the crockpot you are using for your recipes? Made this dish for a date night! Delicious flavors but still easy on the stomach. Mine didn’t turn out are orange-y as the one photographed above, so I added some turmeric to get the color where I wanted it to be. I also added avocado on top and it was an incredible addition and made the meal more hearty. SO GOOD!! First recipe I’ve tried from your site and I plan to try more. Thank you!! Would thai basil be okay? Yes! Thai basil will be great. 🙂 Hope you love this! The formatting on your recipe was confusing for me. The way it’s written for the coconut milk it says “2 ounce cans” with a 14 at the end. It’s unclear you meant to say 2-14 oz cans. I realize I’m the only one who commented on this, but when I was shopping I only got the one can thinking the recipe called for 2 oz only, which I thought was odd until I read through all the comments. Can’t wait to try this recipe, though. SO sorry it was confusing! I’m really happy you figured it out! Looking at it now and it is a bit weird! Again sorry about that! Hii! 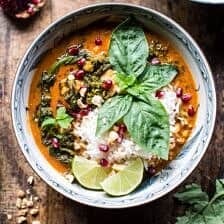 I’ve had this recipe saved for a while (as well as many other of your recipes) and am very excited its chilly enough for me to crave slow cooker currys again! 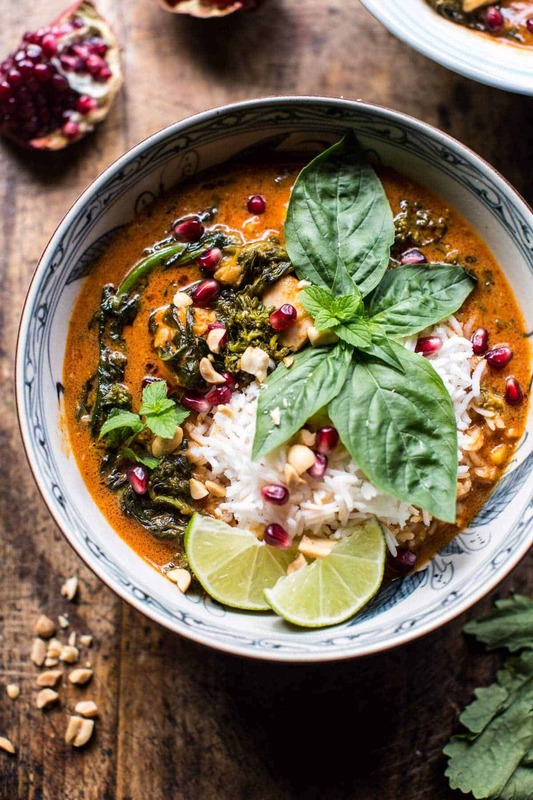 I normally add a 1/4 cup of peanut butter when doing thai curries then garnish with scallions/ cilantro/ crushed red pepper/ peanuts, do you think that would go well with this recipe or would it throw off the flavor?? Thanks for all your great recipes! your blog inspires me! If I were to add some sweet potato how would I go about this? Would you just throw it in raw at the beginning with everything else? Yours is one of my favorite blogs btw I make tons of your recipes, I’ve already done this one a few times and it’s always a huge hit!! Delicious. Hi! I’m excited to try this recipe. Any tips on how to make it in an Instant Pot rather than a slow cooker? Thank you! I made this tonight and it was SO SO AMAZING. I am so glad you loved it! Thank you! I love your blog posts, thank you for sharing your recipes! I noticed that salt and pepper isn’t on the ingredients list. Is there a reason why you don’t add any salt for taste? Just wondering – planning on making this tonight.